You’re sitting in a job interview and everything is going great. 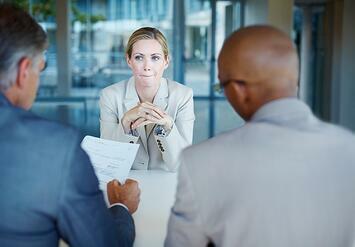 Then, the dreaded question is asked ‘what are your salary requirements for this position?' It’s easy to let this question unsettle you. Say a number too low and you won’t be getting paid what you’re worth. Say too high and you might lose out on the job. Here are a few tips to help you prepare to answer this question. What are people in comparable positions with similar education and location making? The more tangible research you have to back up your request, the more likely you are to receive that for which you are asking. If you are looking for a new position in your current industry, use what you’re making now to help come up with a target value. If you are changing industries, you may have to temper your salary request due to your amount of experience. It may also be a good idea to bring along a few copies of your salary history of your current and past positions. This way, if the question is asked, you won’t fumble and start pulling numbers out of thin air. When practicing for your interview, prepare as if you know this question will be asked. Rehearse it a few times with a friend or family member. Refer back to your research and it may even be helpful to bring along a copy to your actual interview for your reference.The more smoothly you are able to answer this question, the less likely it will be to trip you up. It will also show your potential employer that you have done your research and you've prepared for the interview.